Outego is a professional manufacturer producing and offering various of creative and environment-friendly products. We commit ourselves to offering the best products and services to everyone. Wish you have a good purchase! 24 pieces of invitations with envelopes, a great value kit for the unicorn party supplies. Made with copper plate paper, good quality and more convenient to write on. Laser printing, friendly to environment, and makes a vivid color without fading. Buy without worries, you can get a refund if you were not satisfied with us at any time. 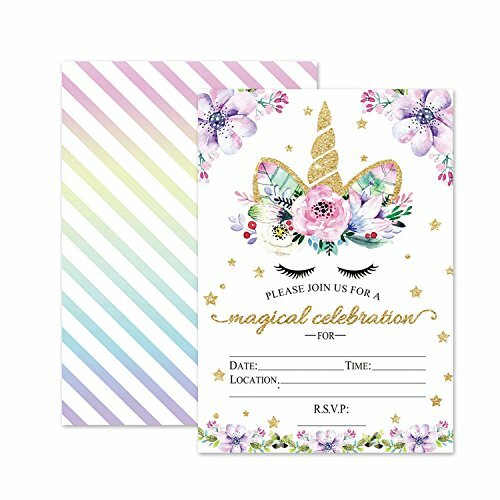 Unicorn Party Invitation Size: 4.7x6.7 inch. Package Includes: Each order includes 24 pieces of Fill-In Invitations and 24 pieces of Envelopes. Stunning Design:Glitter Unicorn with Sparkle Stars Design. High quality, full-color, full-bleed printing on both sides with fill in Style. Environmental-Friendly Materials：The unicorn invites are made of recyclable paper and printed with eco-friendly ink. Great for Different Occasions:Great for Birthday, Baby Shower, Wedding Party and other events. If you have any questions about this product by Outego, contact us by completing and submitting the form below. If you are looking for a specif part number, please include it with your message.